Cologne - Were it not for the goals of , FC Schalke 04 head coach Roberto Di Matteo might not have been feeling quite so chipper in the wake of Matchday 13's 4-1 win over 1. FSV Mainz 05. The Nullfünfers registered more shots, won more tackles and enjoyed more touches of the ball than their Royal Blue counterparts at the Veltins Arena, yet it was the hosts, on the back of a demoralising 5-0 defeat to Chelsea FC in the UEFA Champions League, who came out on top. "We put in a really good team performance today and deserved to win," said Di Matteo after the game. "We played very well in the first half and created plenty of chances. We had to make a change at half time because Jan Kirchhoff was struggling. We coped well. We were solid defensively, but we were also good in attack. We built on the good performance we showed against Wolfsburg." Just as they did against the Wolves a week earlier, Schalke flew out of the traps with two goals inside the opening 25 minutes this past weekend. On Matchday 12, it was Eric Maxim Choupo-Moting's brace that proved the catalyst for the win. Against Mainz, the Cameroonian's strike-partner-in-crime was the headline act. "The link-up play between Klaas-Jan and I is getting better and better," the former Mainz striker enthused. "It’s great when him and I take turns to celebrate." The sixth-placed Knappen's on-song strike duo have been doing exactly that for much of the 2014/15 campaign, having played a part in 19 of the Ruhr district club's 21 Bundesliga goals between them. Front two's aren't such a common sight in football these days, but following the crowd needn't concern Di Matteo as long as his dynamic couplet continue to prosper - even if the team as a whole doesn't always generate quite such a buzz. 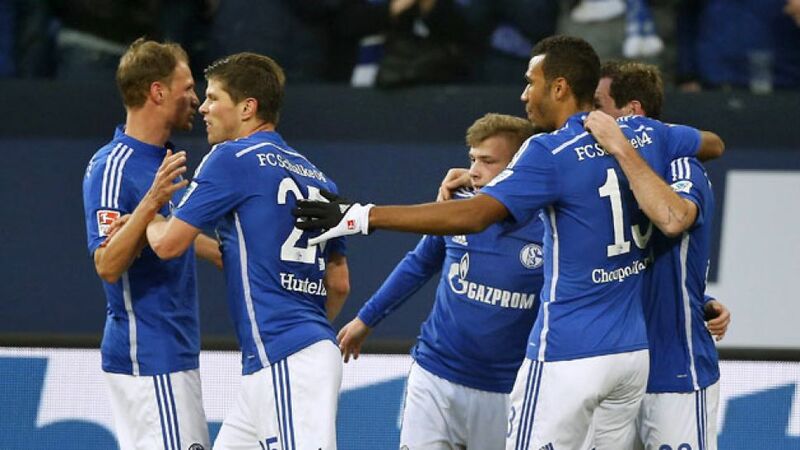 "The game against Chelsea was poor, but it was different story against Mainz," Huntelaar explained. "We wanted to put in a good performance in the Bundesliga after the loss. Unfortunately, we've been too inconsistent. Sometimes we play with concentration and determination, but on other days we don't play to our strengths […] We need to stay positive and remember our aims. We're not too far off where we want to be." A place in the top four is, of course, the holy grail to which the Dutchman referred following the Royal Blues' fourth successive league win at the Veltins Arena since Di Matteo took charge. Only FC Bayern München and Wolfsburg have accumulated more points on home soil this season, but if there's one thing that's going to cost Schalke a place in the UEFA Champions League, it's their wretched away form (W1, D0, L5): a league low. "We need to continue to work hard in order to bring some consistency to our game," reiterated Choupo-Moting. "It's hard to explain how we managed to put in two completely different performances in the space of four days. It's good to end the week on a high […] but it's about time we won away - the game against Stuttgart is our next opportunity to put it right […] We know that we have the quality."